If you’re a sports fan, we doubt you need an introduction to ESPN. It’s been around for decades and is the #1 sports network for basketball, baseball, football, and dozens of other sports. Broadcasting both professional and collegiate-level sports and offering talk shows like Around the Horn and SportsCenter, it’s the most popular channel for sports fans of every stripe. Even just a few years ago, the only way to watch ESPN on the internet would have been with a paid subscription to a cable/satellite provider. But this is no longer the case. Americans continue to ditch sky-high cable bills at an astonishing rate. And as subscriptions continue to hemorrhage, cable TV channels are looking for alternative ways to recapture them. Today, the primary way of doing so is with internet TV services, also sometimes known as “skinny bundles”. Internet TV services such as YouTube TV and Sling TV sell selected packages of cable channels at a discounted rate. Cable networks are delivered directly through your broadband connection – no cable required! Internet TV services tend to have between 40-70 channels, and cost somewhere between $20-$50, with upper-tier subscriptions reaching $70+/month. This makes internet TV much cheaper than traditional cable. Best of all, you can still use your internet TV login to watch TV on websites like ESPN.com – just like you would with cable. If you’re interested in watching ESPN without a cable subscription, here are your top 6 options. Sling TV is the oldest internet TV service out there and boasts over 2 million subscribers and features that are only available for an additional monthly fee. Sling TV does things a bit differently, compared to other streaming internet TV providers. You get to choose from two baseline streaming services – Sling Orange ($25/month) and Sling Blue ($25/month). Then, you can add extra “minis” and additional channel packages to customize your streaming experience. You can also subscribe to both Sling Blue + Orange for $40/month. However, only Sling Orange comes with ESPN channels. Sling Orange gives you ESPN, ESPN2, and ESPN3 for $25/month, which is a pretty good deal. You can subscribe to the $5/month “Sports Extra” package to get even more coverage from ESPNU, ESPNews, NBA TV, and beIN Sports. While Sling Orange is the cheapest way to watch ESPN channels, it’s not without its limitations. You can watch only 1 stream at a time with Sling Orange, and that goes for additional channels from the Sports Extra package. In contrast, the Blue package (which doesn’t have ESPN) lets you stream on 3 devices simultaneously. Sling Orange does not come with a free DVR, either. You’ll have to pay $5/month extra for a 50-hour cloud DVR. There’s another caveat, though – you can’t use the DVR to record channels that are owned by Disney. That includes ESPN and all sub-channels. Sling TV does have good platform support, though. You can watch it on Roku, Apple TV, Amazon Fire, Chromecast, Xbox One, LG and Samsung Smart TVs, iOS and Android, and your web browser. If you’re interested in the cheapest way to stream ESPN without cable, you can give Sling TV a shot with a free 7-day trial by visiting their website. Hulu is venturing into the live TV streaming space with Hulu With Live TV. Though it’s still technically in beta, this service has fully-fledged features which make it great for most cord-cutters. Hulu With Live TV offers only one subscription plan and costs $40/month. You get between 40-70 channels depending on your geographic location. But wherever you are, you get a full selection of ESPN channels. Hulu With Live TV gives you ESPN, ESPN2, ESPNews, ESPNU, and ESPN Goal Line – all in the base-tier subscription. You also get sports coverage from The Olympic Channel, NBC Golf, NBCSN, and CBS Sports Network, among a few others. Another benefit of subscribing to Hulu With Live TV is that you get a totally free Hulu on-demand subscription. You can watch the entire Hulu library of on-demand content, such as The Handmaid’s Tale and hundreds of other shows, for no extra fee. If for some reason you don’t want the on-demand service from Hulu, you can actually get a small discount on the Live TV service. Hulu hides this option far down on the page, but you can get Live TV Only for $38.99. There’s only a one dollar difference, however, and Hulu on-dmand typically runs $7.99 per month for the basic option, so you may want to just go with the original option. You get a free cloud DVR with your monthly subscription, and it gives you a reasonable 5- hours of recording time with no other restrictions. You can boost this to 200 hours with the $15/month “Enhanced DVR” package. You can only stream on 2 simultaneous devices by default. However, with the $15/month “Unlimited Screens” package, you can remove this limit. When you subscribe to this add-on, you will be able to stream on up to 3 devices outside of your home network, and on unlimited devices within your home network. You can combine these two upgrades if you want, and you’ll only pay $20/month for both Unlimited Screens + Enhanced DVR. Platform support for Hulu was limited in the past but has expanded quite a bit. Today, you can stream Hulu With Live TV on web browsers, Android and iOS, Apple TV 4th generation, Chromecast, select Roku models, and the Amazon Fire TV. Xbox One/360 are also supported, as are some Samsung Smart TVs. Give it a shot now with a free trial on the Hulu website, and see what you think. DirecTV Now provides both live TV streaming and plenty of on-demand shows, with more than 25,000+ titles available on-demand. It also has the best overall channel package for the price of your subscription. DirecTV Now gives you a total of four different subscription choices. Luckily, the cheapest $40/month “Live A Little” plan includes both ESPN and ESPN2. You also get good sports coverage from NBCSN and Fox Sports, making this package great for sports lover on a budget. You can get even more coverage if you upgrade to the $50/month “Live A Little” plan, though. You’ll get ESPNews and ESPNU. Other sports channels include SEC Network and a few others. Though DirecTV Now has great channel coverage at a bargain price, it’s still quite lacking in features. DirecTV Now does not come with a cloud DVR, despite the fact that a 20-hour DVR beta has been announced. All DirecTV Now users are supposed to get this DVR by spring 2018, but a solid release date for the rollout has still not been announced. You can also only stream on 2 devices at once. However, DirecTV Now plans to offer 3 simultaneous streams by spring 2018. There’s a catch, though – the wording of their announcement implies that adding another streaming device will cost you an additional monthly fee. Platform support is good, though. You can watch DirecTV Now on Amazon Fire devices, Chromecast, Roku, and Apple TV. You can also watch on iOS and Android, or on the web browser of your choice. If you’re interested, you can give DirecTV Now a try, with a free 7-day subscription at their website. PlayStation Vue has an unfortunate name (no, you don’t need a PlayStation to use it). It combines a reasonable channel selection with a number of useful, family-focused features. If you upgrade to the $45/month Core package, you can get ESPNU and ESPNews, as well as NBA TV, the MLB Network, the NFL network, and a couple of other sports channels. The $55/month Elite package provides access to ESPN Deportes, but that’s just about it when it comes to sports programming. If that’s still not enough for you, you can get even more sports coverage with the $10/month “Sports Pack” add-on. You must have at least a Core subscription to be eligible. This includes 12 total channels like ESPN Classic, ESPN Goal Line, and ESPN Bases Loaded – as well as a number of regional Fox Sports affiliate channels. PlayStation Vue has great features for larger families or households who plan on sharing an internet TV subscription. The primary reason for this is because you can stream on up to 5 devices simultaneously, using PlayStation Vue. This is the best simultaneous streaming policy in the business, especially compared to Sling Orange (1 stream) or DirecTV Now (2 streams). You also get a DVR that’s good for sharing. You can only save your shows and sports games for 28 days, but you have no limits in any other regard. You can record any channel and save all of the shows that you want. 28 days is plenty of time for most people to watch saved content. And despite the name, PlayStation Vue is available on almost every streaming platform. You can use it on your PlayStation 3 or PlayStation 4, of course, but also on Roku, Amazon Fire TV, Android TV, Chromecast, 4+ gen Apple TVs, iOS and Android, and your web browser. Just don’t expect to be able to use it on your Xbox consoles! If you want to give PlayStation Vue a try, you can do so now with a free 5-day trial subscription at their website. YouTube TV is Google’s entry into the internet TV wars, and it’s a good one – with a reasonable price, great features, and a solid channel selection. This channel package includes ESPN, ESPN2, ESPNU, and ESPNews. You also get more sports coverage from NBC Sports, The MLB Network, The Tennis Channel, NBA TV, NBCSN, Fox Sports 1 and Fox Sports 2, and quite a few other networks. Overall, the channel lineup is quite good for sports fans, with no notable coverage gaps. Besides a good selection of channels, YouTube TV boasts some of the best features of any internet TV service. Their outstanding cloud-based DVR is their biggest asset. You can store as many programs as you want for up to 9 months. No restrictions – whether you choose to save 1 hour of content or 10,000 is up to you. You can also create up to 6 individual user accounts, making it easy for each person on your subscription to manage their favorite channels and their DVR. Finally, you can watch on 3 simultaneous devices at once by default, which is very generous compared to services like Sling Orange or DirecTV Now. YouTube TV has also recently improved device support. 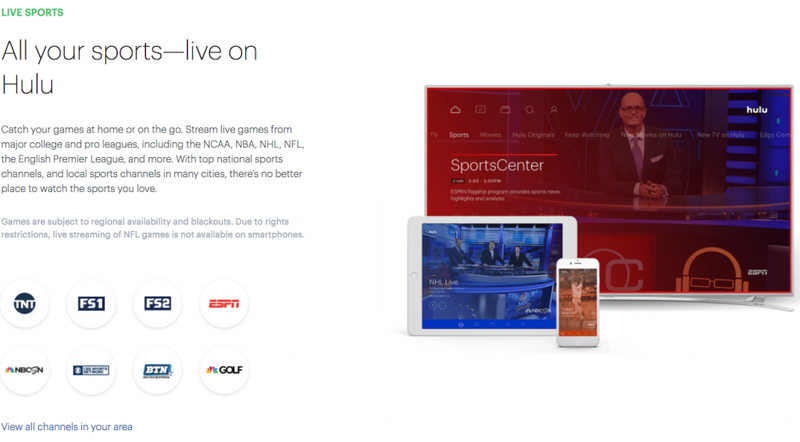 Today, you can stream on your browser, Android/iOS device, or Android TV, as well as Chromecast. Other supported devices include Roku and Apple TV, as well as a few selected Samsung/LG Smart TVs. You can try YouTube TV now with a free trial on their website, and see if it’s right for you. All of the above streaming services will allow you to log into WatchESPN, the mobile app and website that streams live ESPN content. Why do this? Well, the main reason is that watching TV on the WatchESPN app/website does not count towards your simultaneous streaming policy. For example, if you have Sling Orange and your partner is watching TV using your subscription, you can still log into WatchESPN using your Sling credentials – and watch your favorite sports as much as you want.